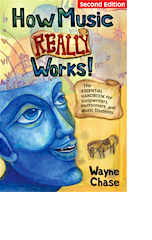 Welcome to the home of the acclaimed classic, How Music REALLY Works, 2nd Edition (6 free chapters). FREE at this site: first 6 chapters (470 pages). This package includes all e-book formats: PDF; mobi/Kindle. epub/Nook. Also includes FREE high-resolution copies of the Chord Progression Chart and the Musical Instruments Poster. This book is also available in print at the publisher's website, Roedy Black Music Shop.